This is a Valentine’s Day recipe, but you can go ahead and make it in a circle shape and eat it any time of year. The parmesan crust is so buttery and fluffy, and the tomatoes burst with flavor on a bed of caramelized onions and cheese. Folding into a cute heart shape was a fun way to make it a Valentine’s Day recipe, and just made me happy. 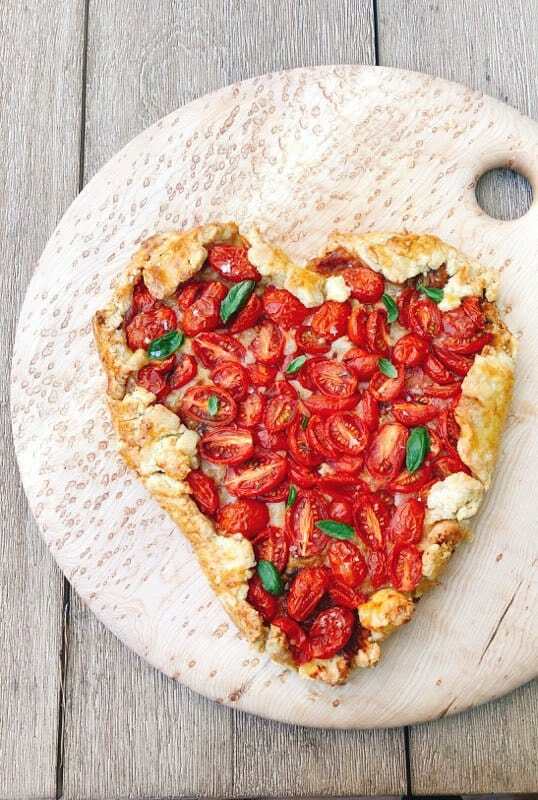 A savory tomato galette in the shape of a heart with a parmesan crust. Combine flour, sugar, salt in a food processor. Add cold butter and process into a meal. Add parmesan and process to combine. Sprinkle with ice water, pulse until just combined. Roll into a ball and wrap with plastic wrap. Chill for at least an hour, up to three days. First carmelize the onions. Melt the butter, add the onions, salt, and sugar and cook over low heat, until onions are golden brown, about 15 minutes. In a mixing bowl combine onions, cheese, and olive oil. Set aside. In a separate bowl, generously salt the tomatoes with kosher salt. Roll the crust out into an 18″ round. Draw a heart shape guide with something sharp, but don’t cut through. At the very top in the center of the heart, made a two inch slit. Save an extra piece of dough from the top edge. Fill the galette first with the cheese-onion mixture. Then add the tomatoes. Fold the edges of the crust over the top. 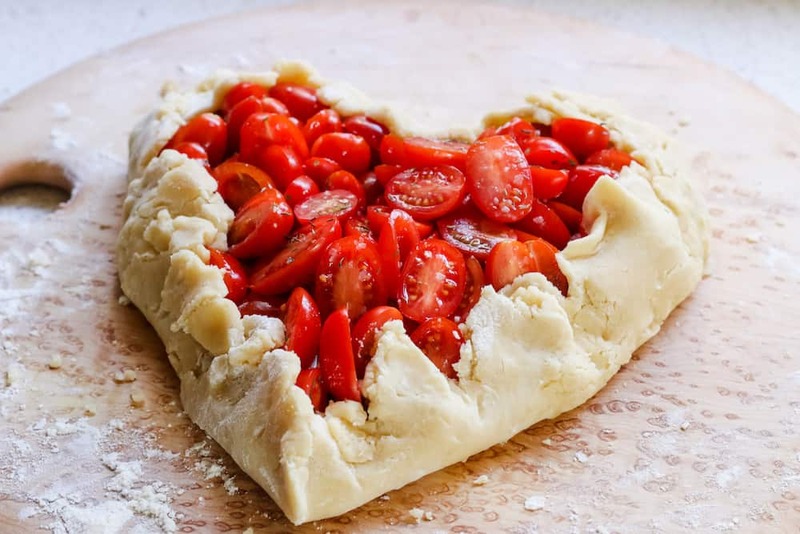 At the top center of the heart, gently pinch to extra piece of dough to help hold the top together. Brush dough with egg wash made of one egg yolk and 1 tsp water mixed. Bake at 425 for 40-45 minutes until tomatoes have begun to pop and crust is golden brown. Garnish with fresh basil. 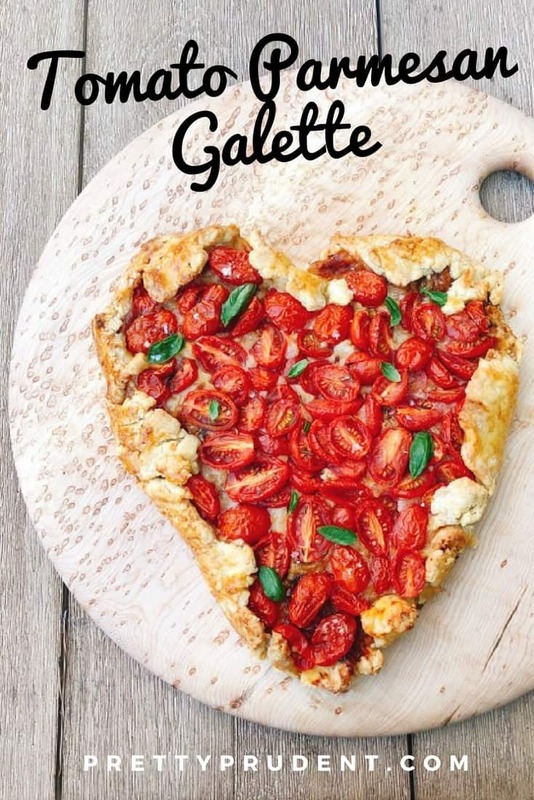 Find more Valentine’s Day inspiration and more recipes!